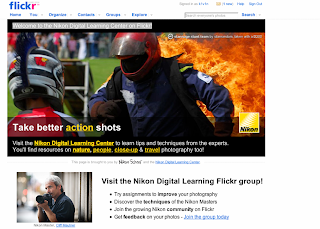 Nikon is taking their online educational content directly to the community of photographers with this new Flickr collaboration: Welcome to the Nikon Digital Learning Center on Flickr! In the old days of the Web (last year) Nikon would have tried to drive the traffic to their own site. Some smart companies/organizations are beginning to realize that if you build it they won't come. You have to go to them. Community building is a hard, if not impossible task for most organizations. Being an active participant in an existing community on the other hand is nothing short of brilliant. We're seeing more evidence that content providers are starting to get-it. Right on, Kevin! A great idea for various and sundry Extension initiatives. Done right, it could also encourage the capture and distribution of tacit lay-community knowledge/wisdom around a particular problem or topic. Absolutely correct about capturing knowledge! Isn't that what we do? From the very start of Extension we've been taking our programs "out" to the people. So why in this new world, so we expect the community to come to us? Doesn't make sense to me. It's been a while since I've heard from you. Thanks for checking in and for your comment! Though I haven't posted, reading the feeds from Hightouch each day helps keep hope alive. Thank you for it. By the way, have you enabled HTML tags here? I couldn't seem to get mine to work. I can't speak for other organizations (probably not even for my own), but as we look at new marketing strategies, this may be one of the most critical components. We need to find more examples like this one. When I consider services like Flickr, YouTube, Delicious and others, I think we have to use our expertise and engage on community terms - meaning if it is Flickr, its about photography; YouTube, video... is it possible to diversify our content and expertise? "On community terms" has a nice ring to it! I think much of the challenge involves re-framing core Extension cultural ideas such as "outreach," "research," "expertise," and "education" to embrace new categories of meaning and action, new collaborations, and new operating environments. As Clayton Christensen describes so compellingly in The Innovator's Dilemma (where he sets forth the concept of "disruptive innovations"), long-established, respected organizations and institutions find radical re-framing nearly impossible to do. "Nearly impossible" still leaves room for imagination--wild or sober--to roam, perhaps transcend, and settle. Thank you so much for your comments. It's comments like these that keep me writing! If all roads lead... then whether we like it or not that's where we're going to have to go. Sort of like, "the people have spoken..."
The puppy looks like such a cutie.